We have a committed and dedicated team of Educators equipped to provide the best possible opportunities for your children to thrive. “Open Day” : Friday 15 April 2015 09:00 – 10:00 a.m. Application forms are available from the Admissions Secretary, Mrs. Jenny Gray. 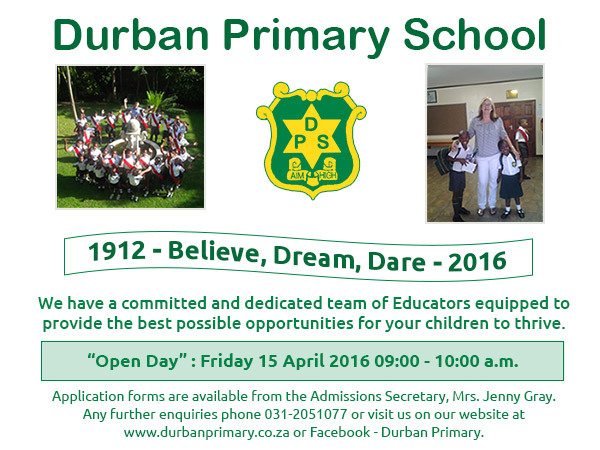 Any further enquiries phone 031-2051077 or visit us on our website at www.durbanprimary.co.za or Facebook – Durban Primary.